I was pleasantly surprised and relieved to realize it did not contain meat. I'm actually eager to try their "meatballs". 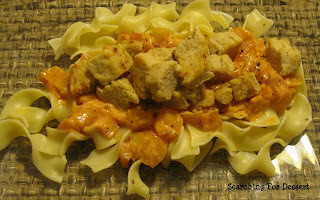 This recipe is made with their Chik'n Tenders and they do a great job in this dish standing in for chicken. When I think of tenders I assumed they were long strips but instead they are in about 1/2" cubes which works better I think. They are very versatile and I have a little more than half a bag left so you will see a few more recipes with them in the coming weeks. 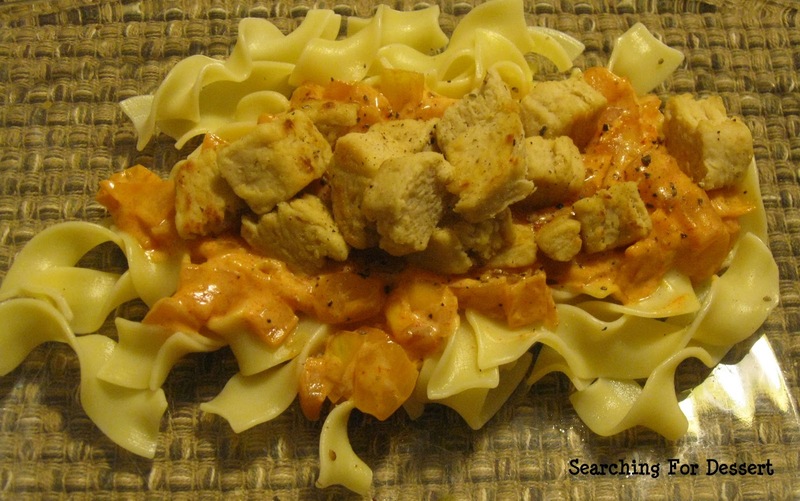 This recipe did steal my entire stove because I chose the cook the chik'n on the stove in a little oil in one pan, the egg noodles in one pan, the sauce in one pan, and green beans in another. You could probably toss the chik'n in the sauce and heat it up for about 15 minutes or until warmed through, but I was also making actual chicken in a pan for my husband and son so I didn't mix the chik'n in the sauce. I find that it's easiest to just cook the meat and "meat" in separate pans then mix it with the sauce on the plate. Although it did take up the whole stove it was worth it and I will be making this dish again. I just purchased some new paprika a few weeks ago and so it's vibrant and beautiful and I was quite excited to use it in this dinner. The color was actually quite bright although it is difficult to tell in the picture. This is a great meal to serve with a vegetable or two and have a balanced meal. If you would like to you could also use Greek yogurt or plain yogurt for the sour cream. I almost always use reduced fat sour cream. 1. In a skillet with 1-2 teaspoons olive or vegetable oil place chik’n and season with salt and pepper. Cook chik’n 10-12 minutes until cooked through, set aside and keep warm. 2. Meanwhile, in a saucepan sprayed with non-stick spray cook the onions on medium-high until lightly browned, stirring occasionally, about 5 minutes. Stir in broth and paprika and bring to a simmer, add more broth if necessary which chik’n is cooking to ensure that the onions don’t dry out. 3. Mix together the flour and sour cream in a small bowl. Add sour cream mixture to the onion mixture along with additional salt and pepper, if desired. Cook over a low heat 2-3 minutes or until the mixture thickens, stirring occasionally. 4. Mix the chik’n into the onion mixture. Serve over noodles.